Good morning! Somehow I have only one photo this week which is interesting because over the last couple of weeks I've felt like this series was winding down. There are some busy, exciting times coming up for my work and my family that require all the presence I can muster. Of course, taking a few photos throughout each week and posting them with a paragraph or two is not hard word, but it's the (self-inflicted) obligation that consumes me. Add to that, Thursday morning is our busiest of the week and I've scrambled on more occasions than I care to admit just to get my post up. So, I did a brief evaluation on what I might be able to let go of to make room for more journal style blogging as well as two upcoming workshops and all that my family needs from me at this time. This weekly check-in was one place to cut back. There are so many things happening in the one photo I have from the week. Snickerdoodles, lentil stew, and homemade marinara are all in the works here. What better way to spend a rainy Saturday? Anyway, thank you for joining me over the last few months! I'll still be sharing plenty of photos from my kitchen, but within the context of everyday blog writing. So, care to join me for one last time? 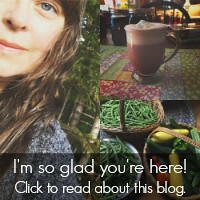 Whether you link up or just share a few words... what's happening in your kitchen this week? I cut the sage back one last time for the season and dried it. Don't you thing dried sage is more flavorful than fresh? Some herbs are like that. Roasted Butternut Squash with plenty of sage is pretty much my favorite thing right now. And seeing as it is so light, we love it as an evening meal. Mid-day, when lots of energy is needed, not so good as a stand alone. But perfect for a cool autumn evening. It feels like there isn't much to say. I rambled on so much last week that today I feel a little quiet. We cooked, we ate... I'm going through nettle tea like crazy. Crack an egg, scramble, eat, repeat. Know what I mean? How about you? What's happening in your kitchen this week? You are so patient. Or, maybe not but that's what I'm telling myself. Thank you! Those apple recipes are all typed up into a post and I've loaded a bunch of photos onto the computer... all will be ready for you in a blog post tonight. I'd hoped to get to it yesterday, but I was pulled in directions other than the computer so it did not happen. But tonight! I have a few hours to myself later today so I'll be able to get it all posted. Two blog posts in one day - sorry! I made some beef broth this week and took the opportunity to make Jenny's Salisbury Steak recipe. It was wonderful! My only changes were sage instead of thyme in the pan sauce, I skipped the red wine and doubled the beef broth instead, portobello mushrooms were used, and I used a little arrow root to thicken the pan sauce... because, gravy. I think next time I'll add another yolk or two to the patties. But do give it a try! I also roasted a huge spaghetti squash and it was perfect with all that mushroom gravy. I cook quite a bit more meat than I used to. And very little grains, legumes, and nuts. Nope - not Paleo (but even if it were, I bristle so much at that inaccurate label that I'd never use it - I'm a little stubborn). I'd love to go into depth about it, (and I definitely will in the upcoming session of Whole Food Kitchen in early 2015), but here on the blog I tend to pull back about personal dietary details. The internet gets a little wacky with that info sometimes. But I will say this - we have found (going on almost a full year now) that a very simple diet of vegetables, good quality fats and meat, fruit, fermented foods, raw dairy, and lots of bone broth has eliminated the chronic migraines my husband has suffered with for nearly 25 years. (That's a sentence worth reading again.) As for me, about a thumb size portion of meat is perfect, then load me up with veggies. One of our favorite ways to prepare cooked vegetables is roasted. 400F, some ghee or other high temp cooking fat, a large shallow baking sheet, sea salt and pepper. The other night I roasted potatoes and broccoli. First, the potatoes went in for 20 minutes... then, I took them out, turned them with a spatula and moved to one side of the pan. Broccoli was added to the other side, a little more ghee on top, sea salt and pepper. The whole pan was returned to the oven for another 20 minutes. Both done perfectly, one pan, two different cooking times. Last week I posted a picture with a little dish of herbs, garlic, and oil. Someone asked what it was - it was just that! Olive oil, minced garlic, rosemary and sea salt. I added it to roasted vegetables in the last 10 minutes of cooking, turning the heat way down so the olive oil did not go past its smoke point, but the garlic was able to get nice and roasty. Combined with the fresh rosemary... oh, man that was good. I remember the first time I ever had flavored olive oil. The year was 1993 and flavored oil was a hot new thing. A woman that Adam and I worked with made us a bottle of garlic rosemary oil for Christmas and we ate an entire loaf of crusty bread in one sitting because the dipping oil was most amazing thing we'd ever tasted. Ah... that's a great memory. It is dark at dinnertime now which makes taking pictures a little difficult. I think I'll dig out the 50mm lens. I was away for a good part of the last seven days so my time in the kitchen has been limited. And the warmth returned! Late October and flip flops do not add up for me. Last night I had a green smoothie for dinner, which became my standard go to dinner during the summer heat. Adam and Emily grilled steak and I cooked them the very last of our green beans from the garden. My hopes of having at least ten gallons of beans frozen amounted to zero in the end. Funny how that works. Most years we're giving away beans to all willing takers, and this year we have none. Another reminder that I am not the boss of my garden, I am the student. What's happening in your kitchen this week? I'd love to know! Three pictures, that's it for this week! We are still elbow deep in apples. The dehydrator is running constantly. Tomatoes are being frozen as they ripen. And peppers... what a pepper year! 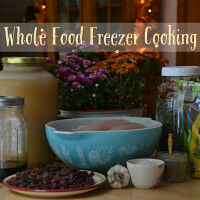 I diced and froze several quarts for quick use when making soups, stews and sauces this winter. I've never had enough to freeze before and am looking forward to their fresh summery flavor come January. Apple Hand Pie (and regular ol' pie) recipes... I'm almost there with my apple post! (Some of you have told me you already have apples ready and waiting for my post. That makes me nervous because I'm notoriously slow with these things. Be sure to go ahead and put those apples in the refrigerator until next week, okay?) I thought I'd have that post up tomorrow but it turns out I have some last minute plans to head out of town for a few days so it doesn't look like that will happen. It's close though! I may not have picked up the camera a whole lot this week but I was in the kitchen nearly every waking hour, it seemed. Now is the time to deal with the last of the garden produce, time's ticking! One pot meals saved us this week - taco soup, beef stew, etc. I firmly believe one pot meals are the solution to our family dinner crisis in this country (now that would be a fun book to write). Who needs complicated Pinterest worthy step by step recipes? The point is to gather, connect, and discuss the day over something tasty and nourishing, yes? The beauty of one pot meals is that most of them taste even better with a day or two (or three) hanging out in the fridge. Simmer up a few different pots of goodness over the weekend and dinner is prepared for much of the week. Take that drive-thru.